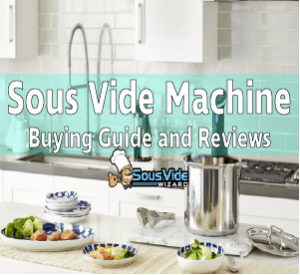 In this review of the Sansaire Sous Vide Immersion Circulator we will look at the many features that this machine has to offer. Sous vide cooking is a great way for anybody to create gourmet style food at home. This is an immersion circulator, so you will need to use it in conjunction with an external stock pot or water container. The Sansaire can work with a maximum of 6 gallons of water so there is plenty of scope for cooking a lot of food. It is one of the best looking sous vide immersion circulators available. It has sleek lines and the black finish is very nice. It is a little larger than other immersion cookers and measures 3.3 inches by 3.3 inches by 15 inches. It weighs just 4 pounds. The Sansaire is made of plastic but it is very sturdy. It has a 1000 watt heating element and it heats water pretty quickly. In a test to bring 4 gallons of water to 140°F from 80°F it only took 16 minutes and was quicker than its competitors. Water levels for operation are important for immersion circulators and the Sansaire scores well here. The wider the water level range the more options exist for longer periods of cooking. When you plan to cook for a long time using an immersion cooker you have to be careful when it comes to water evaporation. If the water level drops too low it can cause permanent damage to your sous vide machine so the Sansaire has an automatic shut off to prevent this. The water level range for the Sansaire is a minimum fill level of 2.75 inches and a maximum fill level of 6.5 inches which gives it a range of 3.75 inches. This is one of the best water level ranges for a low cost immersion circulator. Controlling the Sansaire is very easy. It has a large readout on the side of the machine which is easy to read even in a dark room. On top of the Sansaire there are three buttons which are on/off, a switch to change from Fahrenheit to Centigrade (and vice versa) and a target temperature button. When the target temperature button is pressed, you can adjust using the gray ring on the Sansaire to the desired temperature. It has a cooking temperature range of 0°C to 100°C (32°F to 212°F) and the temperature stability is very good at ±0.1° at 60°C. Water circulation of 3 gallons (11 liters) per minute is achieved by the Sansaire. This means that up to 6 gallons of water can be maintained at a constant temperature, and there will be no hot and cool spots in the water which can spoil your cooking. The Sansaire is fastened to the water container by means of a long clip, which is adjustable for thin or thick pots. If you are using a smaller pot then it is possible to just stand the Sansaire in the water thanks to its flat base. It is always advisable to use the clip. The Sansaire really looks the part and will be a welcome addition in most kitchens. The black plastic is really stylish, and when the green display is working the whole unit really looks great. Maximum points for style here. Your food will never be dried out or overcooked with the Sansaire. You will experience great sous vide cooking results every time if you cook to the right temperature and for the right amount of time. The Sansaire was able to cook steaks perfectly, and you can get great results with eggs too. 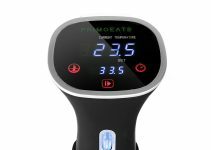 The temperature stability is very accurate, which means that you can rely on good cooking results each time you use this immersion circulator. If you are looking for lots of extra gadgets and buttons then you will be disappointed. Everything about the Sansaire is minimalist, but it does a very good job in producing gourmet cooking which is what it is all about. The controls for the Sansaire are straight forward and intuitive. All you have to do is turn the unit on, and then set your target temperature by using the ring on the unit and you are good to go. 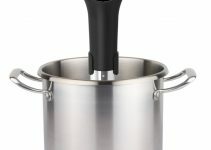 Most stock pots and water containers can be used with this unit, and the clip is a lot easier to deal with than some of the clamp arrangements that you will find with other immersion cookers. You can cook with confidence for several hours because the powerful circulator will pump 3 gallons a minute, and this will ensure temperature stability regardless of the cooking time. It is a good idea to do everything that you can to prevent water evaporation on long cooks, such as using plastic film as a temporary lid. When you have finished cooking with the Sansaire you will find that the unit drains very fast due to the holes in the bottom. There is a cover on the unit which is removable for cleaning the inside of the machine. A cloth is all that is necessary to clean the unit well. A Couple of Needed Improvements..
A small number of users felt that the ring method used to set the target temperature was tricky to use, as it was too sensitive and achieving the exact temperature was very fiddly. This was not our experience and this is not considered to be a major problem. Some immersion circulators have cooking timers and some don’t. The Sansaire is a minimalist machine which concentrates on providing great cooking results. A timer for cooking is available in most kitchens so this is not a big problem. A few users were worried about the build quality of the Sansaire, and felt that being made of plastic it could get easily damaged. Certainly it is not advisable to throw the unit around in the kitchen, but in general it feels well made. The removable cover for cleaning the unit can be a little tricky to put back afterwards but with practice this should not be a problem. For around $200, the Sansaire offers a low entry point into the world of sous vide cooking. It has very good temperature stability, which will ensure great cooking results, and it has good capacity and a powerful water circulator. 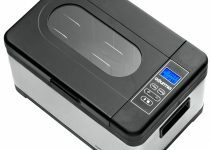 This great sous vide immersion circulator is a good alternative to self contained sous vide machines that cost a lot more. If you are looking for a versatile sous vide cooker then this is it. I’ll contact my web administrator to see if he can take care of this! My sansaire broke after less than 10 months, and they do not respond to either calls or emails. Avoid sansaire all all costs. They are a terrible response company!